Hopes that the controversial ban would improve drinkers' health and turn the streets of Dublin into havens of tranquillity have been cruelly dashed as street violence, date rapes, and potentially fatal diseases such as cirrhosis of the liver, gastroenteritis and projectile vomiting continue to rise among Irish pub-goers. 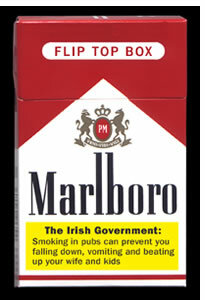 Dr Shaun O'Malley, the Irish Minister of Health admitted to Utterpants that health professionals were completely baffled by the phenomenon until they realised that all the affected people had stopped smoking in compliance with the ban. “It’s clear to us now,” explained Dr O'Malley, “that banning smoking has left Irish drinkers wide open to a range of health problems and injuries they never suffered before." "Such as?" we asked him. "The Saturday night tummy bug which is laying our young girls low." "What tummy bug?" we asked. "It's the strangest ting," explained the Health Minister. "Every weekend, hundreds of young Irish girls complain of dizziness, nausea and a creepin' paralysis in dere legs. Some just keel over in the streets, others vomit where dey stand. We were at out wits end." "Had these girls been to the pub?" Shaun's eyebrows shot up in surprise. "How the divil did you know that?" "A lucky guess," we replied. "Did they smoke?" "No, but we've bloody well told them to start!" retorted Dr O'Malley enthusiastically. "So —" we asked dubiously, "are you telling us smoking is actually good for you?" "You can't argue with statistics." "Which statistics would these be?" we asked. "The ones that tell us that non-smokers are ten times more likely to beat up dere wives on a Saturday night after they've been down the pub." "Isn't that because smokers are banned from pubs?" Shaun's eyes lit up with a triumphant smile. "I taught that at first, but we've talked to all the major Irish breweries and they dismissed the idea that there is some mysterious bug going round all our pubs and clubs." "We meant something in the drinks, Minister." "You must be joking," retorted Dr O'Malley with a lopsided grin. "If there was anything in pubs that made people ill, do you tink the Irish government would allow it?" "So does that mean you will be lifting the smoking ban in pubs?" we asked. "Not only will we liftin' the ban; we're going to make smoking compulsory in the workplace and the home. We Irish are not stupid, you know."